For freshwater and marine aquariums. Reliable and accurate. 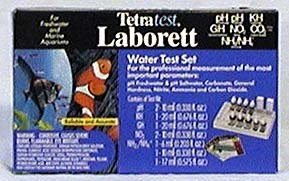 For the professional measurement of the most important parameters: pH Freshwater and pH Saltwater, Carbonate, General Hardness, Nitrite, Ammonia and Carbon Dioxide. 2 test vials, Water Withdrawal Syringe, Color Scales and Instruction Booklet with recommendations and helpful tips.